This is an easy, quick and tasty breakfast prepared using poha (flattened rice). 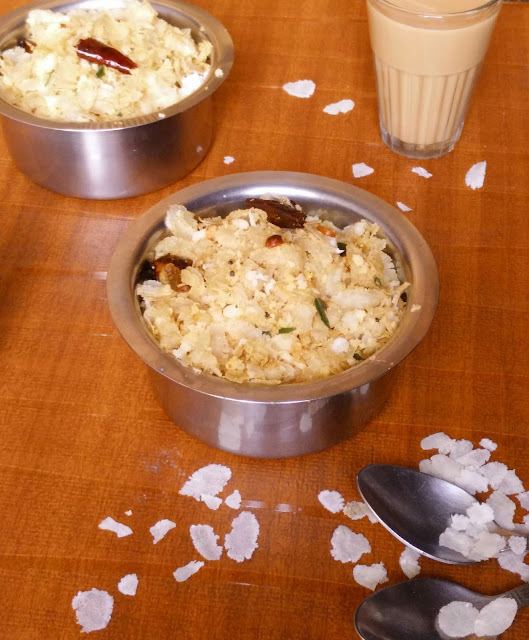 To keep it short,poha(flattened rice) will be mixed with fresh grated coconut, udupi rasam powder, salt, sugar and typical south Indian hot seasoning. 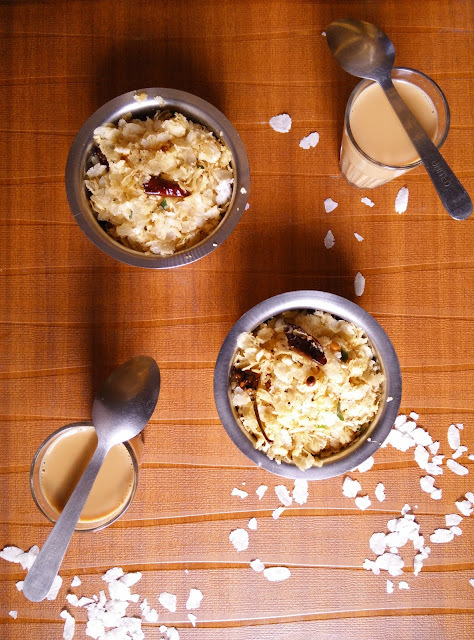 Serve this fresh and tasty light poha as breakfast along with hot tea/coffee. I have already shared the other version of this recipe, "Seasoned Flattened Rice with Green Chilly". 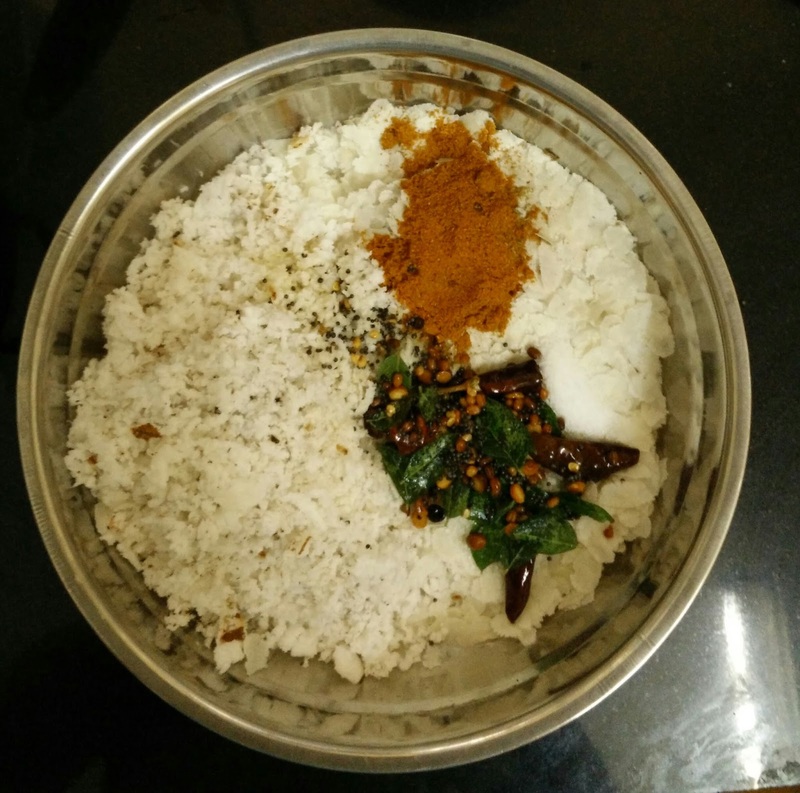 Difference is additional spice powder will be added in this recipe to make the poha spicy and tasty instead of green chilly. 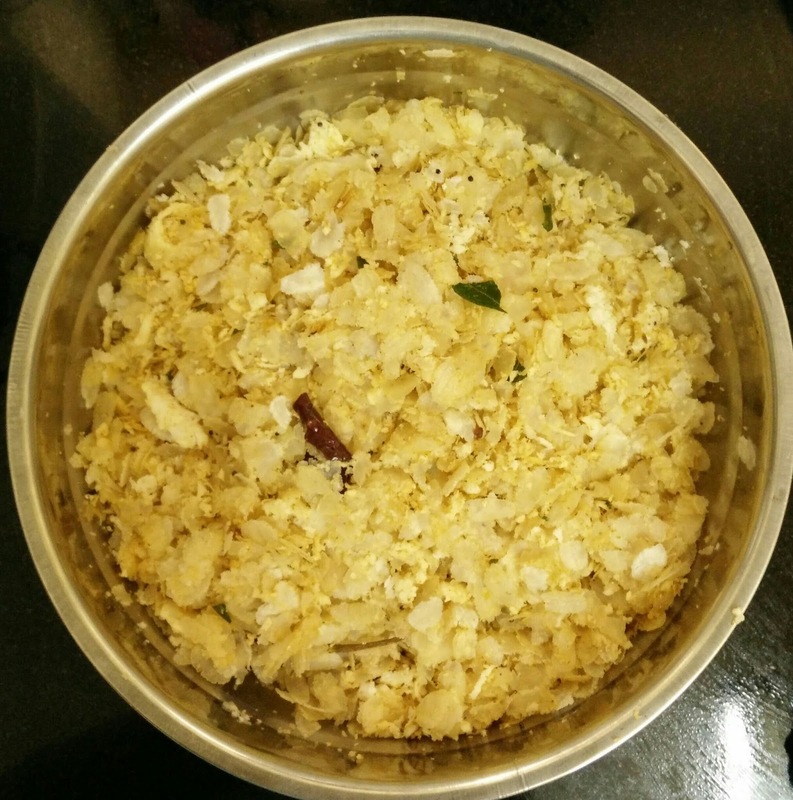 Typically this is served along with rava/semolina upma in coastal Karnataka and the combo is called "sajjige bajil". Try this easy recipe and let me know your comments. Take a large mixing bowl with poha,grated coconut, udupi rasam powder, salt and sugar.Heat 2-3 tsp of oil in a seasoning pan. Now add in urad dal, channa dal and mustard seeds to it. 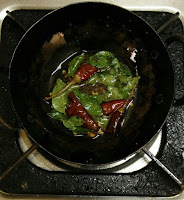 As soon as mustard seed pops out add in, red chilly and curry leaves to it. Fry for few secs and switch off the flame. 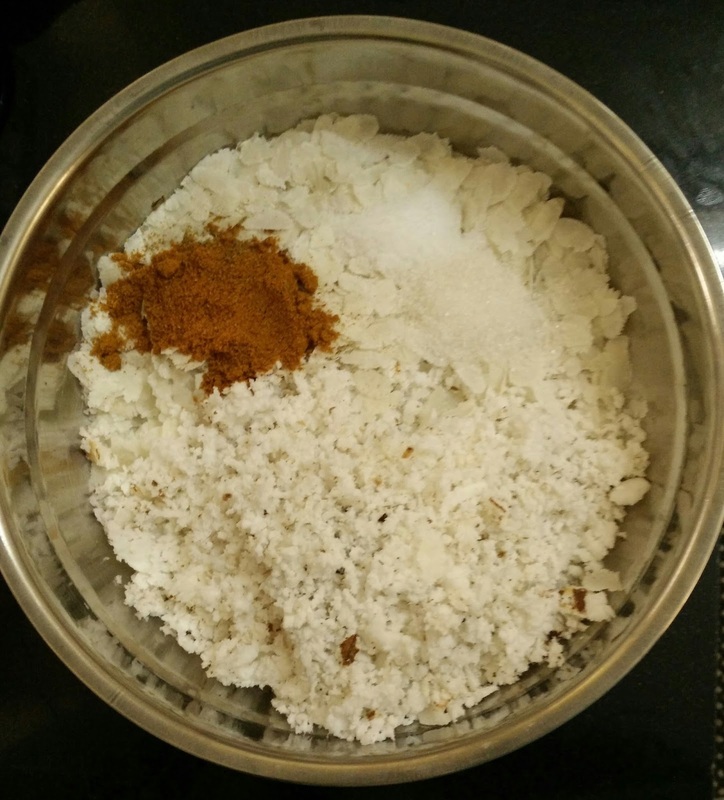 Add this hot seasoning to the poha and mix it well. In this stage, you can even add 2-3 tsp of warm water and mix well so that poha gets little moist.Close the lid and leave it for about 5-10 minutes. Serve it along with hot tea /coffee. 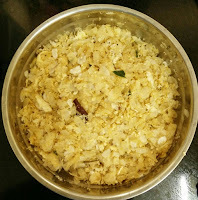 If you like coconut taste, use only two cups of poha for 1 cup of coconut.If you want to reduce the quantity of coconut, you can even add 3 cups of poha for 1 cup of coconut.As we all know adding more coconut enhances the taste. 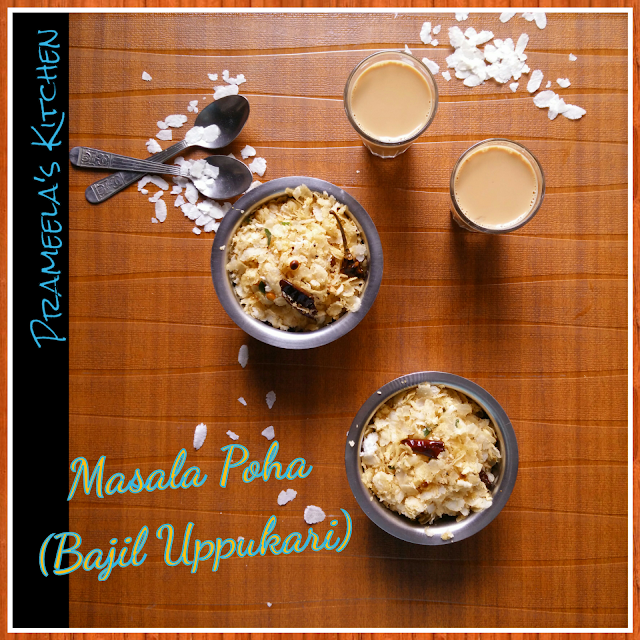 Make sure you use thin poha for this recipe. You can use any other rasam powder too, but make sure that it does not have a raw smell of spices.